Carrot | Albert Moyer, Jr. This is one of my favorite dishes to cook, especially when it is cold and you need extra protein and energy. 1.3kg/3 lbs boneless lamb or beef cut into chunks. 1. Heat oil in large casserole or pot. Brown meat on all sides. Remove. 2. Quarter the onions, and slice the carrots about one inch thick. Cook them in pot for around five minutes until onions start to brown. 3. 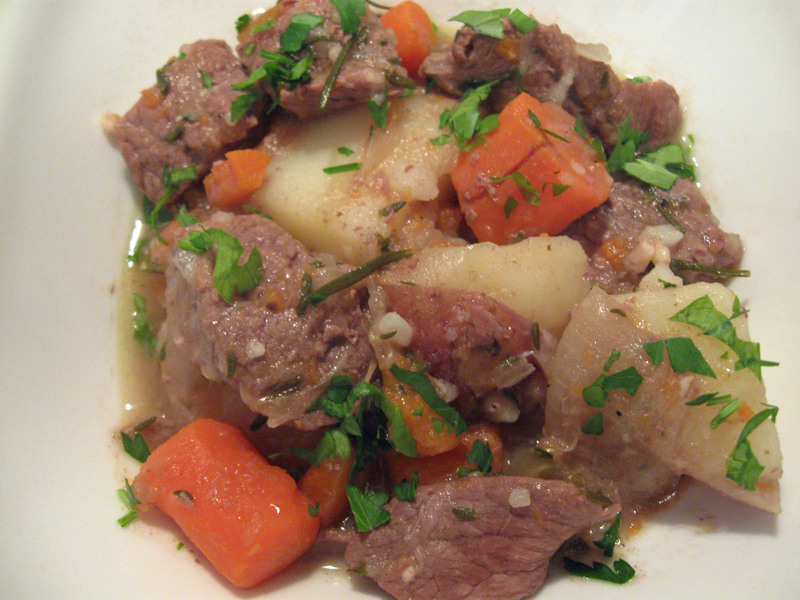 Return meat to pot with water, reduce heat, and simmer for one hour. 4. Add potatoes to pot with Thyme and cook one hour longer. 5. Turn stew off and let settle for ten minutes. Stir in butter. 6. Serve into bowls and top with fresh chopped parsley. 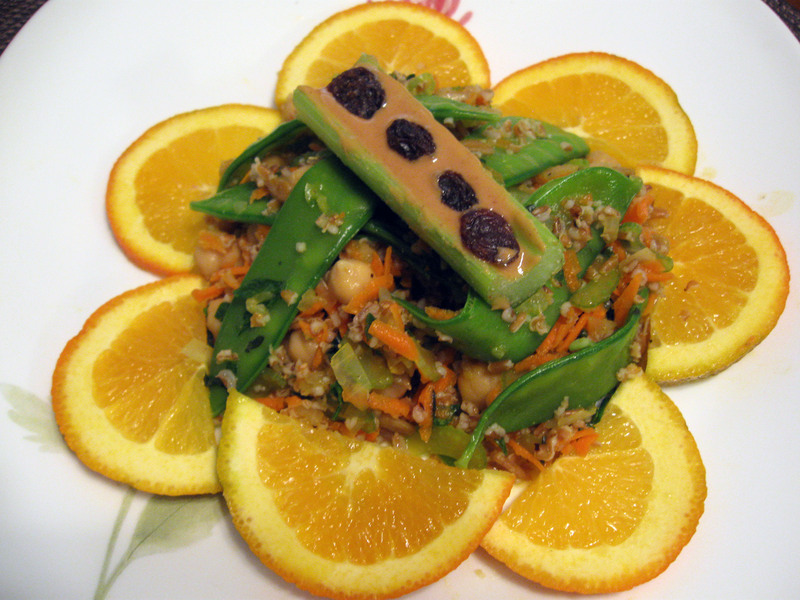 Today, I created a masterpiece vegan salad. The flavors are balanced and you can just feel the freshness, power, and energy with each bite. Here is the recipe and photo. The little celery stick on top with peanut butter and raisins is called Ants On A Log. This was created by one of my children. 1. Boil two cups of water with the 1/2 teaspoon of salt. When it starts to boil, remove from heat and add 1 cup bulgur wheat. Allow bulgur wheat to absorb all water which takes about 15 minutes. 2. In a skillet heat the 1/8 cup of olive oil. When the oil is hot, add the onion, celery, and snow peas. Cook these for about four minutes. 3. Add all the vegetables, herbs, juice, seeds, and bulgur wheat to large mixing bowl. 4. Mix everything together thoroughly and enjoy. This recipe will serve 6-8 people. To start, gather your ingredients. 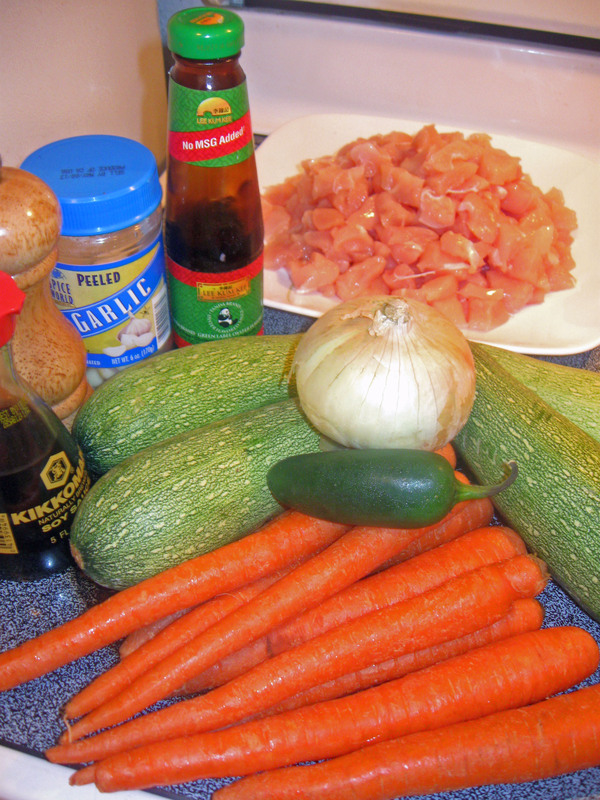 Which are 2 lbs chicken breast, one onion, one jalapeno, four zucchini or calabacita, a bag of carrots, 15 cloves of garlic crushed, soy sauce, oyster sauce (Lee Kum Kee preferred to avoid MSG), and black pepper. This meal will feed eight people easily(I like leftovers), and takes about 40 minutes to prepare. For the Vegetarians and Vegans, add some soy based meat product or stick with veggies and rice. 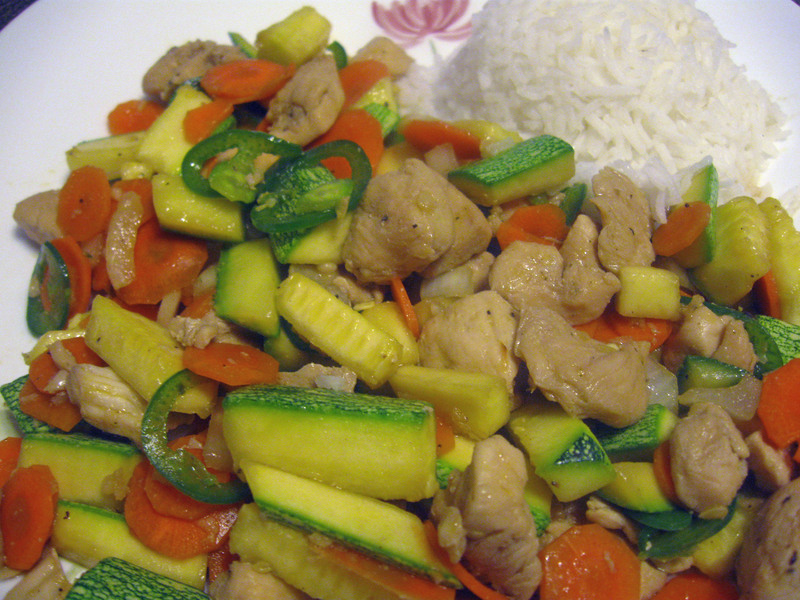 Chop zucchini, onion, and chicken breast. 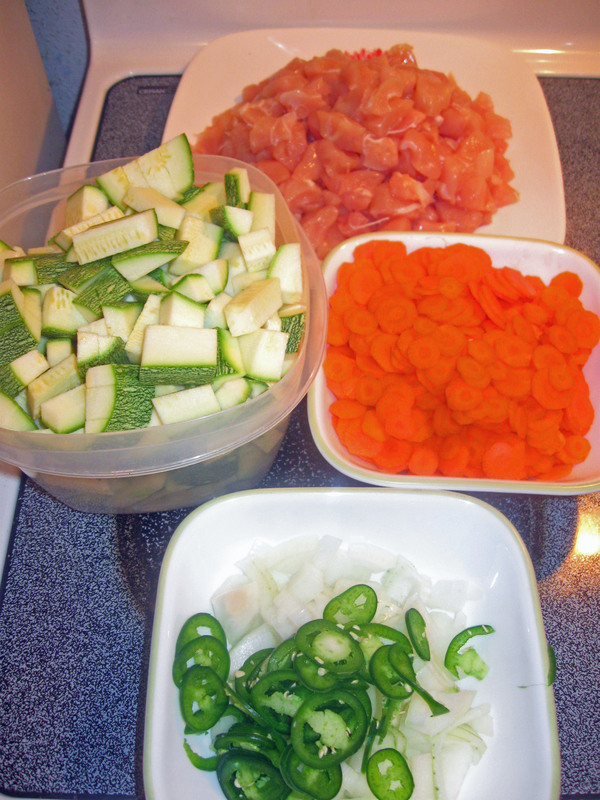 Slice jalapeno and carrots with a mandolin or food processor. I prefer a mandolin. It’s great hand exercise. Watch your fingers! Stir fry meat first with half the crushed garlic and about one tablespoon canola oil, because you will not have room for 2 lbs of chicken, and all the vegetables in a wok. 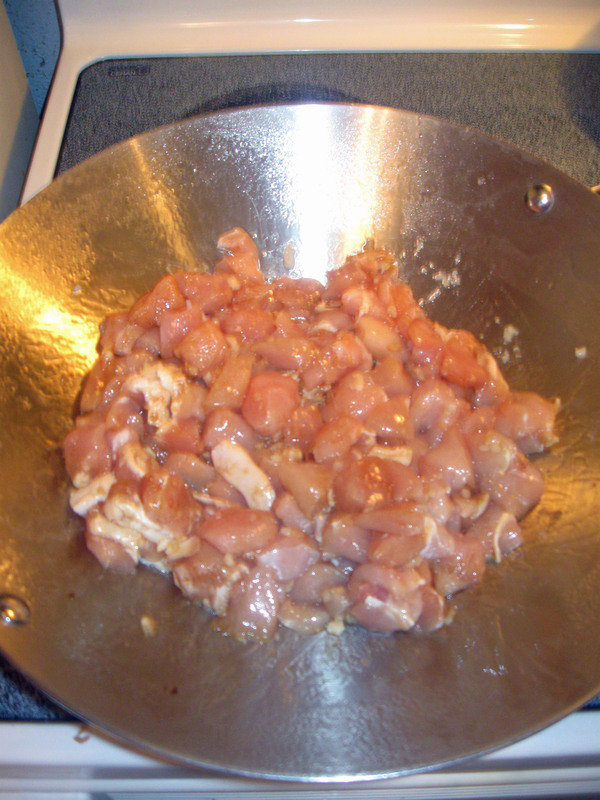 Add about a tablespoon of soy sauce and two tablespoons of oyster sauce to meat. Also, season liberally with black pepper. Cook, drain, and add to large bowl. Then stir fry vegetables separately with other half crushed garlic, one tablespoon canola oil, and two tablespoons of soy sauce, and liberally add crushed black pepper. Cook the vegetables long enough to be warm and crunchy. Mix chicken and vegetables together. Cook two cups of white rice following package instructions. Serve up and enjoy!